CCS together with bio-energy form an essential bridge towards a long-term sustainable energy future. This bridging strategy becomes abundantly clear in all IPCC mitigation scenarios. Considering the great growth ambitions of the developing world together with the recommendations of climate science, neglecting these bridge technologies can lead to disastrous longer-term consequences. Pursuit of more ideologically attractive clean energy options (nuclear and renewables) as a primary climate change mitigation mechanism is no longer an option and will arguably do more harm than good in the long run. Many developed world citizens participating in the energy and climate debate still appear to hold the belief that wind/solar or nuclear energy represent the best solution for the 21st century sustainability crisis and should be made the primary global energy priority ASAP. On the other hand, CCS and bio-energy are much less popular options that are often dismissed without putting much thought into the matter. 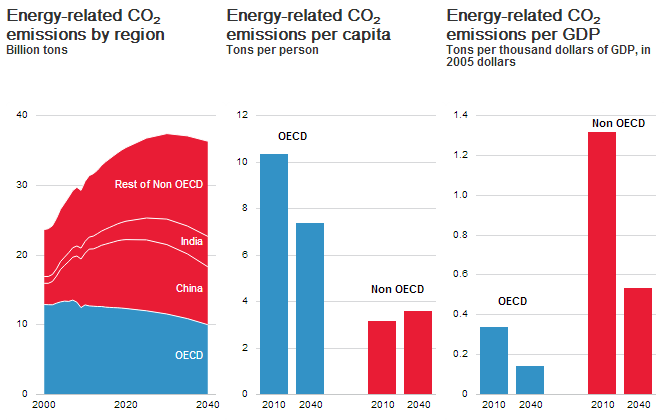 Under more careful analysis, however, these less ideologically attractive clean energy options quickly emerge as the most logical solution to the global conundrum of massive developing world growth ambitions within a very tight CO2 budget. It is fully understandable that people who have lived their entire lives in fossil fueled developed world luxury would strongly advocate wind/solar or nuclear dominated decarbonization pathways. Fossil fuels have already given us an enormous assortment of productivity-enhancing technology and infrastructure which allow us to use a very small portion of our disposable income on basics like energy. From this highly privileged viewpoint, it becomes very easy to entertain visions of not-so-distant futures dominated by distributed wind/solar power zipping along perfectly coordinated super-smart grids or an essentially unlimited supply of clean and dispatchable nuclear energy taking human civilization to the next level. Unfortunately, however, the objective reality is that, barring a number of incredible technological breakthroughs, these visions are badly incompatible with the recommendations of climate science. This fifth and final part of the CCS series will take a closer look at the reasoning behind this statement and further build the case for a technology neutral approach which would naturally favour the bridge technologies of CCS and bio. As described in a previous article on the matter, the developing world may well emit triple the amount of CO2 of the developed world a mere two decades from now (see below). It is also worth noting that this emission pathway is calculated assuming highly optimistic reductions in CO2 intensity (CO2 per unit GDP) of about 3% per year. In the previous decade, the world managed reductions of a mere 0.4% per year. The challenge becomes very clear when one considers that the 6 billion (and counting) developing world citizens essentially want a similar period of industrialization and increases in material consumption as the developed world enjoyed in the previous century. There are some key differences though: 1) the scale of the expansion will be at least one order of magnitude greater, 2) cheap conventional fossil fuels (especially oil) is approaching supply constraints and 3) climate change is now a very important factor. When considering that the world is already in a stage of severe global ecological overshoot (see below), this presents a grave problem. There are numerous reasons for encouraging the development of the developing world, chief of which is the elimination of the typical cycle of poverty where people born into large and poor families do not get access to proper education and end up producing large uneducated families of their own. 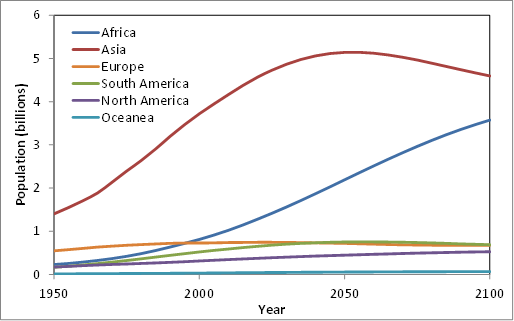 For example, the projected quadrupling of the African population over the course of the 21st century (below) may well be an ecological and humanitarian disaster in the making, especially considering the potentially severe impacts of climate change on African biocapacity. Economic development is the best solution for curbing developing world population growth. 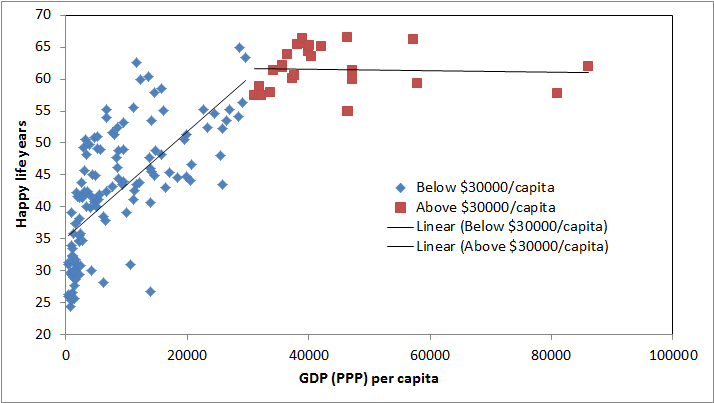 Industrialization and urbanization has been proven to rapidly reduce fertility rates to levels below replenishment (e.g. Europe and Japan). We therefore have little choice other than encouraging a rapid and ecologically damaging expansion in developing world economic activity. In theory, we could do this slower and cleaner (although this would probably be politically impossible), but this will likely come back to haunt us in the form of further population pressure on an already full planet. As shown below, nations almost exclusively begin the process of industrialization with coal. There are some very obvious reasons for this: coal is cheap, reliable, simple, versatile and often locally available in abundance. These properties make coal several times more rapidly scalable than any other alternative in regions of the world where economic development is prioritized much higher than environmental protection (almost all developing nations). Those who do not understand these priorities are encouraged to visit a typical developing world slum or spend a month or so trying to live on 10 times less disposable income. Yes, we have many alternatives to coal, but they are nowhere near coal when it comes to fueling rapid industrialization. Capital costs of nuclear energy in China and India are about triple that of coal, implying that coal capacity can be expanded at roughly triple the pace of nuclear. Coal also has a multitude of direct industrial applications (almost half of Chinese coal is used directly in industry), adding another factor of two into the potential scaling rate. When also considering the value of the simplicity of coal in developing nations with large uneducated workforces, coal becomes roughly an order of magnitude more rapidly scalable than nuclear. As an example, even though nuclear has expanded very impressively in China and India in recent years, the pace of expansion is still about 50 times smaller than coal in absolute terms. As an illustration of this fact, the coal and nuclear energy consumption rates in China and India are plotted below (based on BP data) where it is clear to see that the ratio of coal/nuclear consumption has remained consistently high over the past decade of rapid industrialization. Wind/solar, in turn, are again several times less scalable than nuclear. Yes, in developed nations, nuclear is very expensive, takes many years to license and construct and faces great societal resistance, thereby making it less attractive than wind/solar at present. For the developing world (where the vast majority of new energy infrastructure is being constructed), however, the situation is very different. Nuclear capacity is only about twice as expensive as wind/solar capacity, implying that, when adjusted for capacity factor, it is at least two times cheaper. And then of course it must be mentioned that nuclear, unlike wind/solar, is a disptachable technology that can be seamlessly integrated into tried and tested centralized electricity networks that will remain mandatory to power the rapidly growing megacities of the developing world for decades into the future. This brief analysis should make it clear that nuclear or wind/solar is not going to power 7% economic growth rates in the developing world. Unless we see some enormous shale gas expansion, this rapid growth demanded by billions of developing world citizens will continue to come primarily from coal. 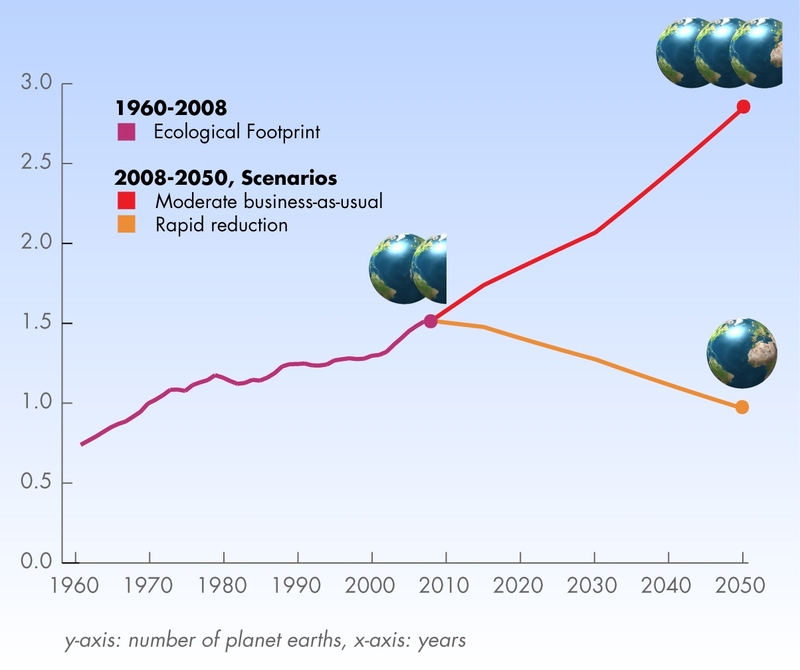 The developing world will still require several decades of rapid economic growth before approaching the point where further increases in material consumption no longer translate into significant increases in happy life years (a point already reached by the rich world as shown below based on data from the Happy Planet Index). As discussed above and in a previous article, this rapid economic expansion will continue to be driven by fossil fuels, primarily coal, thus resulting in continuously increasing CO2 emissions into the foreseeable future. Due to this simple trend, the world will have locked in all allowable emissions for the “fairly safe” 450 ppm target within the next 3 years and will probably overshoot this target sometime in the 2030’s. This implicitly implies that that, if climate science is correct, we will need to achieve rather impressive retroactive mitigation from existing infrastructure as well as some enormous negative CO2 emissions over the course of the 21st century. This will be the role of the bridge technologies: CCS and bio. 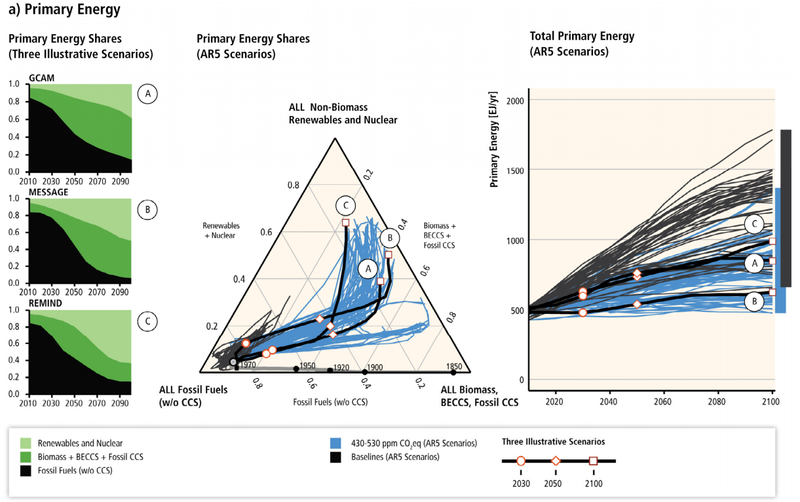 To illustrate the importance of bridge technologies, the IPCC has mapped out multiple decarbonization pathways on a very interesting tri-axis graph (shown below). It is abundantly clear that each and every scenario achieving CO2 concentrations in the range of 430-530 ppm first proceeds from unabated fossil energy to CCS and bio before making the turn up to the ideologically attractive future of nuclear and renewables. If climate science is correct, this really is the only viable path forward. Considering the wide scatter that usually typifies the IPCC scenarios (something which is understandable considering the great uncertainties involved in forecasting global CO2 emissions almost one century ahead), the unanimous trend in the figure above really should send a very strong message. All mitigation scenarios resulting in CO2 concentrations deemed to be “reasonably safe” by the current scientific consensus on climate change first head to the right (CCS and bio) before turning upwards (nuclear and renewables). Considering the enormous growth ambitions of the developing world and the very tight emissions budget prescribed by climate science there can be very little doubt that CCS and bio-energy must play a central role in the global energy future during the 21st century. Directly pursuing the ideologically attractive end-goal of a zero-carbon nuclear and renewable energy system is not a feasible strategy to keep global emissions within reasonably safe limits and a CCS+bio bridge towards this end-goal is clearly prescribed in all IPCC mitigation scenarios. This is a vitally important point for all renewable/nuclear advocates to understand. Yes, the long-term future must be dominated by sustainable energy sources such as gen IV nuclear and wind/solar power, but advocating nuclear or wind/solar as a primary strategy for rapid CO2 mitigation can do more harm than good in the long run. In particular, ongoing technology-forcing of wind/solar power at the expense of much more efficient technology-neutral approaches will only serve to lock in additional unabated fossil fuel infrastructure and have almost no direct impact on global emissions due to the price-driven rebound effect. If climate science is correct, such a scenario can be nothing short of disastrous in the longer term. Advocates should therefore be very careful when marketing renewables and nuclear energy as primary climate change mitigation mechanisms. Pushing for preferential treatment of these sources is at least just as detrimental to the longer-term sustainability of our planet as it is beneficial. Yes, there are good arguments for wind/solar and nuclear power, clean air and energy security probably being the two most important ones, but when it comes to climate change mitigation, these approaches fall far short of the less ideologically attractive alternatives of CCS and bio. Finally, it is vitally important for developed world citizens to realize that these side benefits of solar/wind and nuclear are still of low importance in developing nations where disposable incomes remain around one order of magnitude smaller than in the developed world. In other words, the practicality, reliability and scalability of coal is still valued much higher than the air pollution it causes. Even climate change is a matter of less concern in the developing world since getting rich as quickly as possible is probably the best defense that these billions of people have against an increasingly hostile climate system. It is fairly safe to say that nothing will stop the 6 billion (and counting) developing world citizens from pursuing rapid economic growth and, currently, there are no alternatives that even come close to challenging fossil fuels as the primary energy source behind this rapid industrialization. The choice is therefore simple: finally get pragmatic about climate change (scrap all technology-forcing policies for a true technology-neutral approach) or pray that climate science is grossly in error (on the pessimistic side).